Working out and staying fit is an essential part of my life. It is so important for both my physical and mental health. But working out can take a real toll on my feet, and that is why it has become of the utmost importance for me to have the proper footwear, workout shoes that look good and perform, whether I be running, lifting weights, or engaging in a host of other physical activities. Finding the best-fitting shoe among the many choices at your local athletics store isn’t always easy. To ensure you walk out a happy customer, you need to make sure the shoe fits properly from heel to toe and that it can perform under the sometimes brutal conditions you’ll put them through. In this article we will break down the anatomy of a good workout shoe, show you what to look for while shopping, and review several of the top women’s workout shoes on the market today (8 finalists out of 12 original pairs). This is everything above the sole. This part of the shoe is typically made with layers of fabrics and mesh sewn and glued together. More modern models rely more on knitting and printing to create one-piece uppers that better stretch or support in where you need them to. Look for an upper that is most shaped like your foot and feels smooth wherever it touches. You want to make sure there is no binding or chaffing. This it the wrap at the top of the shoe opening. It holds the heel firm in place. Pay attention to ensure that your heel does not slip, and how the padding interacts with your ankle bones, and make sure the curve along the back does not irritate your Achilles tendon. This is the semi-rigid cup layered inside the rearfoot. It is designed to cradle and support your heel, so it is a very important component of the shoe, and plays a big role in determining if a particular shoe is going to be comfortable in the long term or not. Many shoes have an external heel wrap while more minimalist shoes have done away with the heel counter. This decision was made in order to allow full freedom of movement. Contrary to popular belief, and according to modern research, heel counters do not provide motion control. What they do is ensure that the heel is centered so you experience stable landings when planting your foot and provide supplementary support. Look for: a heel that is both firm and supportive but also allows for a wide and smooth range of motion. This is the reinforced area that surrounds the instep—the area near the arch of a person’s foot existing between the ball of the foot and the ankle—that tangents the laces and is designed to hold the shoe firmly on the foot. Modern shoe-designers have created a variety of overlays, eyelets, and lacing systems which is meant to form the saddle closely to a wide spectrum of foot shapes. Look for how the saddle fits and embraces your foot. You want it to provide a secure feeling with minimal rubbing and slipping, while enabling the natural arch of your foot to maintain its shape during your stride. This area includes all of the upper part of the shoe, from the front of the eyelets to the end of the shoe. The toe box is often capped with a reinforced toe guard that keeps the fabric off your toes and protects you from potentially stubbing your toes on an uneven surface. This is particularly important with trail shoes or shoes that you will be using on uneven and unpredictable surfaces. Look for a toe box that is not in the way, one that allows your foot to flex and spread out in a natural way. You want to make sure that you have room and flexibility both in the sense of width and length, and that your toes do not bind or rub. Typically, this part of the shoe is made from a composite of rubber or foam compounds that are strategically placed to enhance the life of your shoes, and to also increase bounce or flexibility, depending on the specific purpose of the shoe. Look for materials that are going to provide traction and durability without sacrificing too much in terms of weight or stiffness. The shoe needs to bend like your foot bends, and that is the reason why flex grooves and a toe spring are placed on many modern running and exercise shoes. This component is often under the ball of the foot. Nuances in location or angle can shift the mechanics and feel of the shoe. What degree of flex is appropriate for you depends on a variety of factors, including stride changes and the speed with which you are running. Look for a shoe that moves and flexes the way that you want to move, based on the pace you will be utilizing while using the shoe. This is the foam material between the outsole and the upper. It is installed on shoesto cushion the runner from impact and to provide guidance to the foot. Look for a midsole thickness and material that feels right at the speeds you will be running. You do not want a midsole that is either too soft or too firm, and be conscientious about excess weight. This is material in the midsole material that absorbs shock when the heel strikes the ground. Although the body provides most of the cushioning you need for your joints to maintain their health, comfortable cushioning can very much assist with this effort. Look for the right mixture of cushioning, stability, and ground feel. Do this by analyzing whether the shoe touches down where you want it to and moves into the stride in a way that feels natural. Material located in the midsole that is designed to reduce the impact of forces created during the stride that happens during forefoot loading and push off. Look for a shoe that is responsive and forgiving, trying to find that shoe that has a balance of comfort in the cushioning and a platform that provides you with a firm push-off. his is the difference in height between your heel and the ball of your foot when standing in the shoe. Look for a shoe that feels comfortable for you during the entirety of your stride, not just in a standing position, take-off or landing. Look for a fit that noticeably reduces stress in any parts of your foot that you have historically thought of as weak or compromised. Now let’s take a look at three of my favorite shoes currently on the market, as I explain my experience with each shoe and determine what may likely be the best fit for your exercise and adventure pursuits. Nano weave upper: When talking about shoes, the upper is the entire part that covers the foot. The specially woven, synthetic upper of shoe provides maximum breathability to the wearer. It can be nearly impossible to get a good workout in shoes that are too heavy, hot, and uncomfortable. High abrasion rubber outsole: That is basically just a fancy way of saying that this shoe is really durable. The outsole was designed to take a lot of impacts and keep your feet protected. 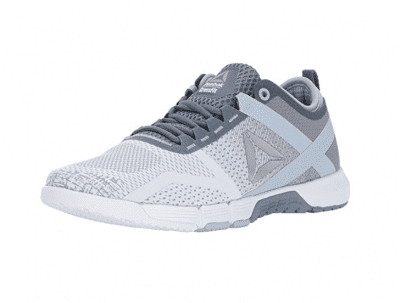 The outsole of the shoe is easy to overlook if you are new to CrossFit, but you want to make sure you get a shoe that has a durable outsole because it will be hitting the ground a lot. CMEVA midsole: The compression molded EVA midsole is there for cushioning and comfort. The midsole is designed to help keep your foot stable and prevent it from really feeling the terrain under you, such as sharp rocks. CMEVA midsoles are becoming more and more common and are just a small part of what makes this shoe awesome. Low profile: The Reebok Grace truly offers superior comfort with its low profile. The low cut design of the shoe prevents the sides from rubbing against your ankles and gives your ankles much more room to move. When you are doing something like Crossfit, it is important that you have good ankle mobility. Heel counter: The heel counter of the Reebok Grace can be felt as soon as you put them on. You can feel the shoe sort of gripping your heel and supporting it, which is exactly what it was designed to do. The heel counter gives you better support and stability during workouts, decreasing the chance of accidents or injuries. I didn’t think it would be considered a top feature, but it is still worth mentioning, the heel tab on the Grace makes it easy to slip the shoes on. Instead of struggling and folding your shoe over on itself, using the heel tab you can get better leverage and put the shoes on much easier. The shoe also looks awesome and comes in an assortment of colors. You can have your choice of colors such as pink, black and white, and grey and navy. Like most shoes, breaking them in is always the worst part. It may take some time to get your feet used to these shoes, and to get these shoes used to your feet. It may be uncomfortable sometimes at first, just try to power through and eventually they will start to feel better. Internal strap: Not visible from the outside, this internal strap provides maximum support for whatever your workout has in store. It provides support for quick and multidirectional movement and may increase your overall performance and agility. Dual density foam midsole: This dual density foam midsole eliminates the need to choose between stability and cushioning, it gives you everything. Usually running shoes are either considered stabilizing or cushioning shoes, and each one was for a specific type of runner. Runners who over pronate would use the stabilizing ones, and runners who did not would use the cushioning ones. If you are the very beginning of your CrossFit journey, you probably do not know what type of runner you are, but that’s okay, because these shoes are great for both. Tight fit: When I say tight, I don’t mean they run small or that they choke your feet, I just mean they fit snugly. Instead of having shoelaces hanging down, the laces are in a lace up closure. Instead of having big bulky sides or a thick topline, these shoes fit closely to your feet for a secure fit and to prevent tripping. Mesh upper: The comfy mesh upper of this shoe is perfect for breathability. It’s not too thick, but still thick enough to protect your feet. The mesh upper also just looks super sleek with its nearly seamless finish. Solid rubber pods on outsole: Lastly, the solid rubber pods are carefully placed on the outsole in areas that receive a lot of wear. This adds to the overall durability of the shoe and improves your traction. Getting shoes with good traction can be super important in CrossFit because you never know what terrain you might be on, or what the weather might be like. No matter what, you want to know that your shoes will still perform and you won’t end up losing traction and slipping. The biggest advantage of this shoe, to me, is how comfortable it is. The inside is lined with silky soft fabric, none of those itchy liners that just irritate you. The tongue and collar are also padded, adding a little more comfort to the shoe. Second only to its comfort, is its stylishness. These shoes definitely look a little different than your typical tennis shoes. They are much more modern and sleek and come in several different colors. The only downside of this shoe that I have heard about is it running a little narrow. As I said before, this shoe was meant to be pretty snug, but if you have wide feet, it may be a little too narrow for your comfort. I have not personally had this problem, but if you know you have wide feet you may want to hold off on buying this one until you can try a pair on in person. 4 mm drop: If you remember from earlier, I said a 4 mm drop is ideal for someone who wants to use the same shoes for running and lifting. The 4 mm of this shoe makes it so you have enough cushioning and support to run, but not too much to shift your weight and mess you up while you are lifting weights, making this a versatile shoe. Crystalized rubber outsole: The crystalized rubber outsole adds to the overall durability of the shoe. It also increases traction on various terrains and adds to the natural flexibility of the shoe. That means the shoe can keep up with you better and does not limit your movements. Removable insole: Adding to its versatility, the removable insole is perfect for when you need to lift. Once the insole is removed, you have better access to the reinforced heel cup, which will help you take your lifting game to the next level. Reinforced heel cup: The reinforced heel cup gives you great leverage during lifts, which isn’t something you usually get from a running shoe. The heel cup also provides great support to the bones in your feet and legs while you are lifting. Low cut design: The Nano is a lightweight shoe, which shouldn’t slow you down or anything, but what really contributes to your mobility and agility is its low cut design. The low cut design of this shoe provides ankle mobility and greater comfort. It allows your ankles to breathe and perform maneuvers that would otherwise be difficult. The upper of this shoe employs nano weave technology to create a comfortable, breathable shoe that can be worn all day. You know how some shoes you just can’t wait to get off? That’s how my old tennis shoes were, and when I tried these I honestly forgot I had them on for a while. My feet don’t get too hot and they’re just very comfortable. I also really like the design of the shoe. The low cut design, mixed with the sleek appearance of these shoes make for a very visually pleasing shoe. The only downside of this shoe, if you could even call it that, is that it comes in a very wide array of colors. In total, there are 20 different colors to choose from, some of them being more expensive. When I picked out my pair, I was overwhelmed by all the options at first. All of them looked so cool right away, but after taking time and looking at each one, I was able to decide which one I wanted. I figured if I really liked them I could always just order another pair in a different color when the first pair gives out. At the end of the day though, color is not a huge deal, and I would rather have too many options than no options at all. Dual density foam midsole: As we learned before, the dual density foam greatly adds to the shoe’s versatility. The foam makes it so that this shoe will provide support and stability to anyone using it, despite what type of runner they are. In this case, the dual density foam also helps with heavy lifts. Rubber along the mid sole: The rubber running down the mid sole does more than just look cool. It adds durability and is specially designed to provide protection during rope climbs. Rope climbs are a very common part of CrossFit, so a shoe that you can do rope climbs in is necessary. Firm, flat heel: This is different than most of the other shoes on the list. Instead of having a raised heel, the Metcon 2 has a flat and firm heel, which greatly increases stability during lifts. You want to be able to stay flat on the ground and in full control while lifting; the Metcon 2 makes that doable. Fly wire cables: Fly wire cables are threaded through the interior of the shoe, which provides support for your mid foot. The wires wrap around the foot, sort of like tendons, and provide you with unrivaled support, no matter what you are doing. Whether you are running, lifting, lunging, or just stretching, more support is never a bad thing. If you have never had shoes with fly wires, it may take some time to get used to them being around your foot. At first I found it kind of annoying, but I really like the fly wires now and I can feel the support it gives me. Abrasion-resistant film: I was pretty impressed when I learned about the abrasion resistant film that Nike uses on these shoes. I had never heard of another company using that, but it is such a great idea. Crossfit is really intense and lots of sustained movement will inevitably create heat. That film is there to prevent from high heat friction damage, ultimately increasing the lifetime of your shoes and minimizing wear. The forefront of this shoe contains flexible grooves, which allows natural motion to take place. Instead of feeling like your shoes are working against you, the flexible grooves allow the shoe to do what you want it to. The forefoot is also made of sticky rubber, which greatly increases your traction and grip, this will help keep you steady and safe. Like the Nano, the only real downside of the Metcon is that there are so many color options. There are even more options for the Metcon than the Nano; some of these options are white, maroon, orange, turquoise, and pink. The good news is if you have a favorite color, it’ll probably be easy to choose which one you want because chances are they have that color. Rubber outsole: The rubber outsole of the Tazon 6 increases traction and grip while you are using them. Rubber outsoles are not uncommon, but the carefully designed outsole of the Tazon 6 is certainly unique. The unique design helps the user get the best grip possible. TPU shank: When talking about shoes, the shank is the main supportive structure between the insole and the outsole. It is important to have a strong shank, without one your shoes don’t really stand a chance up against the elements. In this case the shank is made from TPU, or thermoplastic polyurethane, which is a very durable plastic that is resistant to abrasions. This greatly increases the stability of the shoe and makes the entire shoe better overall. Cushioned midsole: The cushioned midsole of this shoe does exactly what you would expect it to. 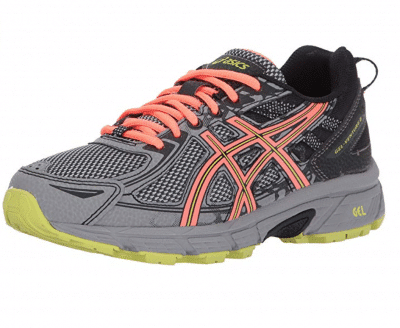 It provides the wearer with cushioning, lessening the impact of long runs on your feet. As you can imagine, cushioning makes the shoe more comfortable. EVA heel pod: The EVA heel pod in this shoe is pretty unique to this shoe, I don’t think I’ve seen it anywhere else. Essentially, instead of using the EVA in the midsole to absorb shock, Puma has put it in the heel to absorb the shock. Depending on how you run, you may be putting a lot of weight on your heels, which can actually damage them. This heel pod aims to remedy that problem and it also acts as cushioning, making this shoe even more comfortable. Thankfully, the Tazon 6 also features a comfy and breathable sock liner. When you put the shoes on, you can feel the liner conform around your foot, and at first you’d expect it to make you hot and sweaty, but it does the exact opposite. It whisks away moisture and keeps my feet at a comfortable temperature. The design of the shoe is also quite nice and the Puma logo is just the finishing touch that it needs. The only downside of this shoe is a very minor one; it has no heel tab. This is probably just a matter of personal preference, but I like a heel tab on shoes, especially shoes that are supposed to be snug. I try to avoid untying my shoes at any cost, so a heel tab would have made it a lot easier to get them on and off. Other than that though, I cannot think of anything wrong with these shoes. 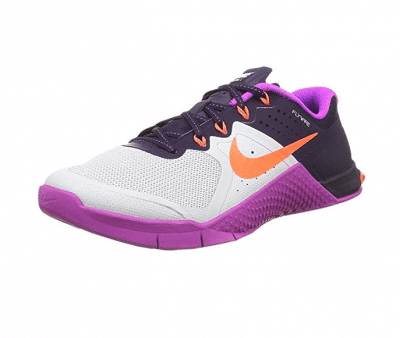 The Women’s NIKE Flex TR 7 Training Shoe boasts a design that is inspired by the classic roman sandal is a lightweight and breathable upper with a supportive platform designed for flexibility and traction in every direction. This shoes design is intelligent and intuitive, incorporating a forefoot cable design that provides a secure, locked-down fit during your gym workouts. 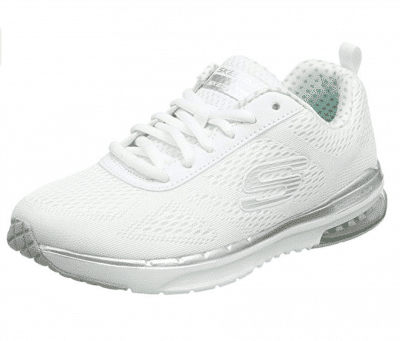 I found the Skechers Infinity Sneaker to be very comfortable and stylish, almost like you’re walking on air. The mesh upper with fine mesh outer layer resulted in both great air flow and a stable fit, and the dual-lite midsole provided lightweight support and flexibility. The shoe offers a lace-up closure for a nice secure and snug fit, and a durable heel strip with a pull loop which made it very easy for me to get on and off. 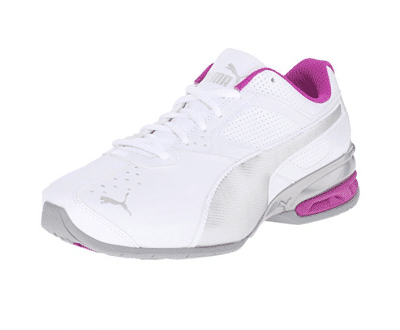 The cushioning and support is top notch and great for walking; however, this shoe lacks support for workouts. very comfortable, especially during long hours of use. the shoe was smaller than my usual size. not the best for workouts because it lacks lateral and arch supports. Loved this shoe, especially for my more rugged pursuits, this shoe comes complete with a trail-specific outsole and high-abrasion rubber, meaning great traction in a variety of weather conditions. Rearfoot GEL cushioning absorbs shock, and kept my feet safe and comfortable while running, and I was able to remove the sockliner so I could insert my custom orthotics. I found the Asics Gel Venture 6 to be a versatile running shoe that I could use in a variety of workout environments, but did perform best on woodland trails. This is a great all-around shoe and I found the price point was quite reasonable based on the quality of the shoe and how it performed. Removable Sockliner to easily accommodate a medical orthotic. versatile: biking, hiking, and walking. Don’t buy purely for looks. Don’t get me wrong ladies, it is important to look good out there in the gym or on the trails, but do not let the look of a shoe or the aesthetic totally consume your decision-making process. Do not compromise fit and functionality in exchange for looks. Ideally you want to find the perfect balance of both. For me I found it is important to figure out what fits right and what supports my foot in the way I need, and from there choose what looks best. Find deals or buy online. Avoid this big-time in store markups and instead look out for deals online, or buy shoes from a previous season that have been discounted. Don’t buy shoes that are too small. Small shoes or ones that do not fit are the worst. I have made this mistake many times, and just led to a lot of pain and frustration. Making sure your shoe fits right is of paramount importance, nothing else really matters. Don’t assume your size. Don’t assume one size fits all or that sizes will be congruent amongst different brands. Often one brand of shoe will size a little different than another brand. So even if you think you know your size it is important to remember that the size of your last shoe may not be the right size for your new pair of shoes. If I am going to change the brand of my running shoes I do some research on the internet and see what people have to say about how they fit, and I also found that my shoe size has shifted and altered over the years, so I usually take a new measurement of my foot when buying new shoes. Shoes have a shelf life. Remember it is recommended to replace your shoes every 300 to 500 miles. Easily do this by keeping track of the date that you bought them. Obviously, the main factor when purchasing workout shoes is to decide what are you primarily going to be using them for. For me, I run a lot, mostly short distance, high intensity, but I also like to go on hikes with my girlfriends, and I play the occasional racquet sport, so I tend to go with a shoe that is multi-functional yet offers great support and is of course stylish and nice to look at. Activity level: your activity level shoes be an important consideration, the more you intend to work out the more durable your shoes will need to be. If you plan on working out 3 days or less you can opt for a shoe that’s less durable (but not by too much, you still want to protect your feet!) On the other hand, if you intend on training 4 or more days a week you will probably want a more durable shoe. Only count the days you intend to do CrossFit training when making this consideration unless you want your CrossFit shoes to be dual use which we cover in more depth below. More than just CrossFit? 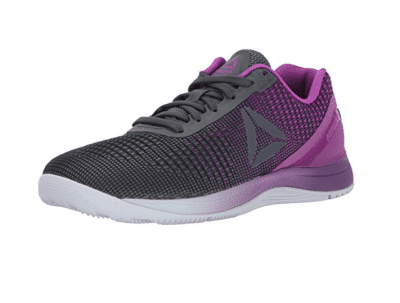 If you’re using CrossFit as your primary training method, you should consider a shoe that’s more durable and able to withstand rigorous movements time and time again. On the other hand, if you’re supplementing another type of training with CrossFit, you can probably opt for a more versatile shoe depending on your needs. IE: if you’re primarily a running who wants to supplement with CrossFit you can probably opt for a slightly more flexible shoe for additional versatility. The opposite is true for a weightlifter supplementing with CrossFit, you’ll probably want a slightly more rigid shoe than the average CrossFit shoe. Protection: if you intend to use items or exercise in such a way that it may hurt yours toes (for instance, rope climbing or jump roping) you’ll need to consider extra durability in the toe area. The hit from a rope can leave you in toe pain for days. And the climb down your rope may damage your shoes and cause them to wear out faster. These two exercises aren’t the only ones that could ruin the toes of your shoes (or injure your toes!) It’s important to think about all of the exercises you intend on doing and the impact they could have on your toes. Breathability: if your feet cannot breathe you will get really sweaty, really fast, and that leads to stinky feet and an increased risk of fungal and bacterial diseases. Fungal infections can get pretty gross and make your feet smell awful, but wearing breathable shoes greatly reduces the risk of fungal infections or diseases. Breathable shoes are also just much more comfortable, and comfort should play a big role in your decision making process. If you buy shoes that are uncomfortable you’ll never want to wear them, and you will never workout, or you will work out in the wrong shoes, which might be even worse. Style: personal fashion taste and preferences are also important factors when deciding what shoe is best for you. It may seem superficial, but you will enjoy the shoes and the workout so much more if you actually like the way they look. If you find a pair that you really like, but they are out of your budget, unless you are in a hurry to get them, you can always wait a little bit and see if they go on sale. You may also be able to purchase them at a lower price from an online store. Local climate: if you intend on training outside (even just a little) your local climate should also be considered. If you live in a climate that never sees snow, but sees sweltering temperatures you should consider a CrossFit shoe with some additional aeration to keep your feet cool. On the other hand, if your climate regularly receives snow you should consider a shoe that will keep your feet warm, but not too warm. Additional or less traction may also be a consideration depending on where you plan on training and how. 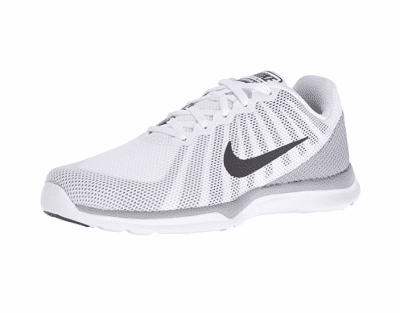 After using and testing the above shoes my clear winner is the Nike Flex Trainer. 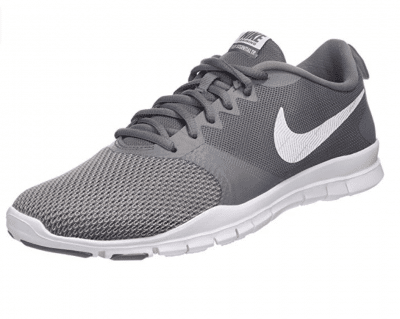 The Nike Flex Trainer is sleek, fits great, has the best overall support of all the shoes I have worn, and boasts a trendy design, coming in a variety of colors. Overall I was able to use the Nike Flex Trainer in a variety of my exercises, and because of this I found it to be the most versatile of the shoes I tested out. It really is the best all around running shoe, mostly because of the great support and flexibility that they provided. A Lightweight and comfortable trainer, it was an excellent shoe for fitness boot camps, aerobics, and gym training, but also performed well on hiking trails and while playing racquet sports. The shoe, unlike many of its competitors was true to size, had high-quality construction and performance, and is available at a very reasonable price point. solid support that its sturdy and firm midsole provided during workouts.